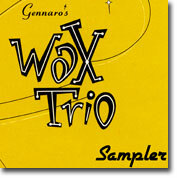 Wax, Inc. provides the best in alternative musical entertainment. Based in San Francisco and New York - with shows in between and abroad - we have a fine repertoire to suit your venue or upcoming event. "Refreshing music for guests to sway along to while waiting to refill their Campari and soda." "Gennaro is quite skilled on guitar. All manner of kitsch-oriented sounds are his Trio's domain..."
Featuring Bass Skills of NYC's Wayne Roberts. 4-piece guitar, bass, drums + organ. Bass + Guitar - Perfect for formal settings. Great for all settings. Good jazz alternative. Copyright © 2010 - 2019, Gennaro Cannelora. All Rights Reserved.